Another huge weekend of gaming this past weekend. My son ran a game Saturday night with his group and on Sunday we started our new Forgotten Realms game. We were having some old friends over on Sunday, people my wife went to high school with. These are the people that traded high-tech jobs here in the suburbs to go out to the country and start a sustainable farm. Not my life, I love my city-born conveniences too much, but they have turned it into something really cool. Anyway, two of their three kids were coming over plus a friend and playing video games all day was not going to keep their attention. All the kids expressed an interest in playing so I had about 12 hours to figure out what to do. Of course the answer was right in front of me. I pulled out my adventures for the Second Campaign and looked over some of the material I have been reading about the Forgotten Realms. I had been thinking for a bit now that the best way to learn about the Realms is to jump in feet first. Sure I can read books, but what I really need to play in it using the books people used then. After that everything clicked into place. I was going to start the Second Campaign in the Forgotten Realms! I know a lot of the adventures in my Second Campaign are very Greyhawk focused, but that is not a big deal really. Not like I have not swapped out worlds before. 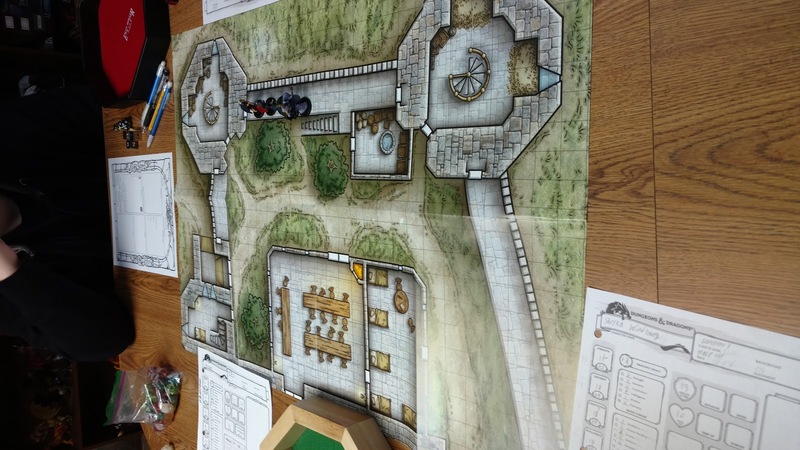 A quick run to DriveThruRPG for a copy of N5 Under Illefarn and then print it out and I had my ready to go adventure. I liked the module because A.) it had a bunch of mini-adventures for 1st level characters. B.) It gave them a base of operations in Daggerford. and C.) it was the first published Forgotten Realms labeled adventure so many people got their start right here. Originally the Second Campaign was going to stick with AD&D1 rules, but since I had three new players I wanted to run something that might know and can easily pick up if they want to play themselves. So after some debate with my oldest we settled on 5th Edition D&D. I am going to run it though like an AD&D game. So no tieflings or dragonborn. More gnomes though, never have enough of those. We ran through the "lizard man" portion of the adventure and it went over great. I have created a new gamers. The charters will be a revolving cast by necessity; I need to make it flexible for people to be able to come in and out of the game whenever. Or if my kids have friends over and they want me to run something. Starting in Daggerford gives me a nice locale and is still small enough scale that I don't need to worry about the world at large just yet. I am going to follow the same basic plot/outline of the Second Campaign and add Realms lore in as it comes up. Not sure yet how many of the famous characters of the Realms will show up, but that is a decision for a later day. There are some things I need figure out. 1. What year, by Dale Reckoning, is it? 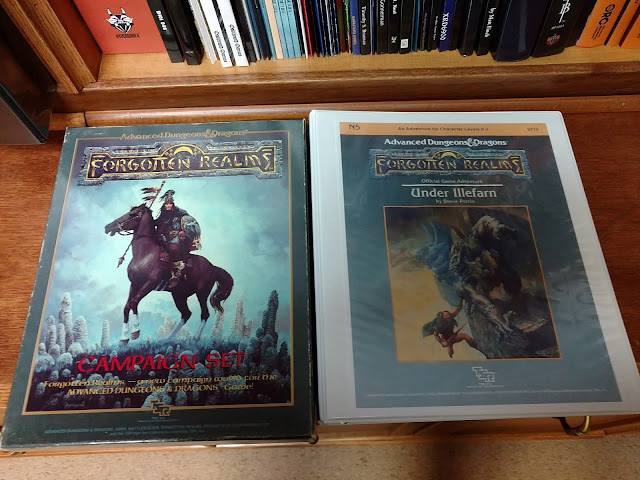 I started with Under Illefarn which is the beginning of the Realms in 1st Ed AD&D. I am also using the Sword Coast book above for 5th Ed. If I remember right there are a few hundred years between the two. Now this may or may not matter. But I at least want to get my NPC stories straight. 2. I need some good Spellfire 5th edition stats. Cynder, who was lost in the Come Endless Darkness game, will show up here. She is, more so than anyone, a perfect candidate for Spellfire. 3. Is this a different world in the same universe (evidence of that), a different universe OR even jsut the same world in the same universe, just another part of it. The fact that it is 5th edition leads me to want to make it the same universe at least. None of these questions need to be figure out today. But I am going to want a direction to run here soon. That is where my reading will take me. Here I am. In the Realms. Just 30 years later than everyone else. I gotta say, I really enjoying it so far. Good morning! Welcome to the Realms. the Forgotten Realms have always been the default setting of mine for any edition of D&D, ever since I got my hands on the City of Splendors Box Set. So hopefully I can help to answer your questions. Q: What year, by Dale Reckoning, is it? 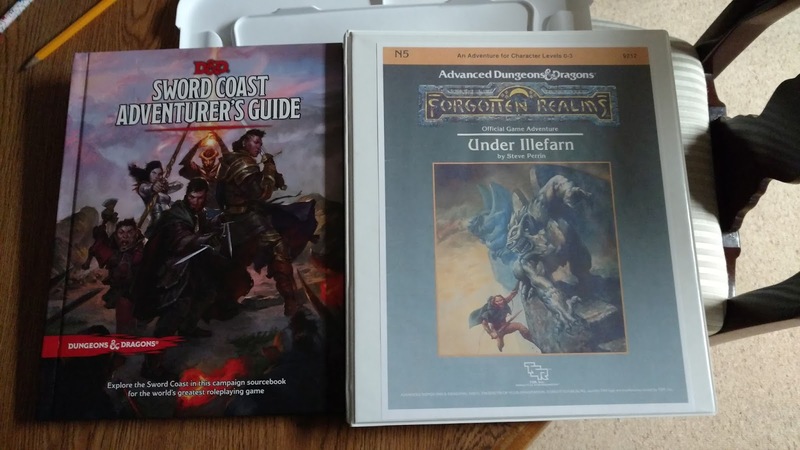 I started with Under Illefarn which is the beginning of the Realms in 1st Ed AD&D. I am also using the Sword Coast book above for 5th Ed. If I remember right there are a few hundred years between the two. Now this may or may not matter. But I at least want to get my NPC stories straight. A: The year Under Illefarn takes place is 1347 DR. The current year per the 5e Sword Coast book is 1489 DR, 152 years later. Q: I need some good Spellfire 5th edition stats. Cynder, who was lost in the Come Endless Darkness game, will show up here. She is, more so than anyone, a perfect candidate for Spellfire. 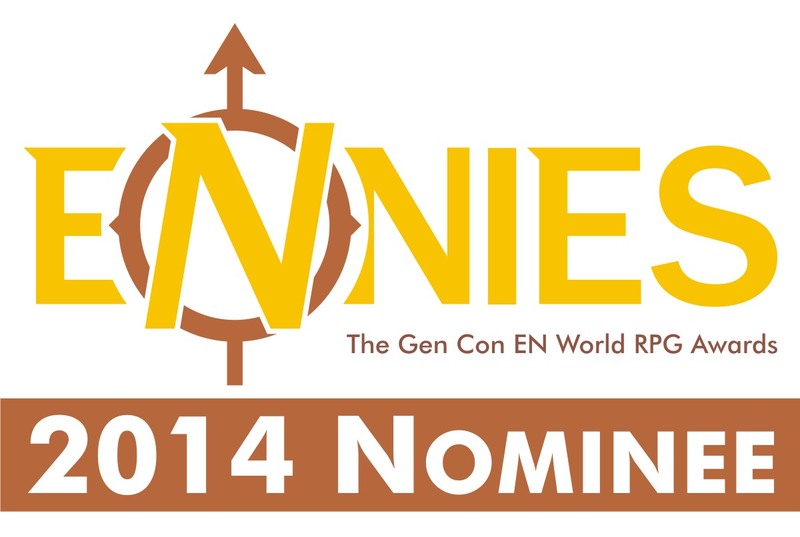 A: There are several great resources for 5th Edition D&D. One is the official wbsite y WOTC, Unearthed Arcana. There they post playtesting material for possible changes or new material. I've used a few things from there and highly recommend acquiring their free compiled PDF of all their material up to a recent point. 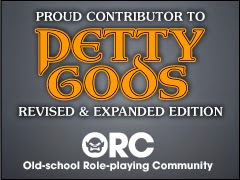 The other great resource for 5th Edition is the DMs Guild. It's a website with all sorts of fan made material for 5th Edition. Just taking a quick look, someone has made up a Spellfire ruleset for 5e, though unsure of how balanced it is. Q: Is this a different world in the same universe (evidence of that), a different universe OR even just the same world in the same universe, just another part of it. The fact that it is 5th edition leads me to want to make it the same universe at least. A: 5th edition Realms is the same universe as the previous editions. however, there have been several global upheavals that have altered the world. Between 3rd Edition FR and 5th Edition, we've have The Spellplague and The Sundering. 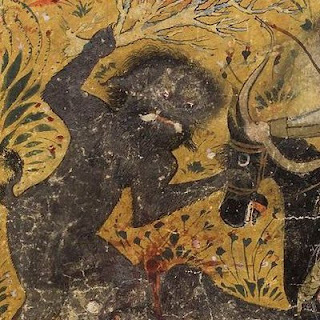 The Spellplague marked the transition into 4h edition and focused on trying to bring the world back to a more "wild" time; points of light (civilization) dotting the countryside with large wilderness between. It also altered magic as a means to try and fit the 4th Ed rules. The other BIG change with the Spellplague as the merging of Abeir and Toril. Where Toril is the main world of The Realms, Abeir is a sister world just out of phase with Toril (In a pocket dimension). The Plague merged chunks of those worlds together (hence the Dragonborn's arrival). With The Sundering, that marked the transition to 5th edition and the separation of Abeir and Toril to their rightful places. That is so awesome! Thanks so much for all of this. I'll need to digest it and see how to make use of it all. The seven sisters source book has information on spellfire. As far as how you run the realms, that's entirely up to you. In my version the companions don't exist, however everything else is canon unless it conflicts with my game. Have fun and run the world as you wish. These are books I have written or contributed significantly to. - *PRUEBA DEL KAISER* *KAISER TEST * Prueba combinando dibujo tradicional y Cintiq. Test mixing traditional drawing with Cintiq. UPDATED: Mythic Ireland - John just updated his Mythic Ireland setting for use with Blades & Black Magic. Download a copy now! - I love that he looks exactly like would would think a young Patton Oswalt looks like. Moving - The Purple Duck Games blog can now be found here. Batman v Superman: Wonder Woman first look! - We have some scenes of Wonder Woman in the new Batman v Superman trailer. Looking forward to this! Sapphire Beach - Beeeaaauuutiful beach shots by Tony Lin - Playing with Shadows - taken in Australia last November. How gorgeous is that light??!! The Most Unread Blog on the Internet. Ever. "Excuse me, can you repeat that in Olde Arcane?" All material unless otherwise noted is Copyright 2017, Timothy S. Brannan. Picture Window theme. Theme images by sololos. Powered by Blogger.